So Black Friday is almost upon us! Heart of Haute is having a 20% off Black Friday sale – which goes live Thanksgiving Day (tomorrow) at noon PST and ends Black Friday night (11:59pm PST) – and a Cyber Monday sale. The Cyber Monday sale will be live on November 26. It’s a “buy any one item and get the second item for equal or lesser value for 50% off” sale. Use code “CYBER” – quotation marks mine. Heart of Haute Beverly dress in Sage Pinecones print. 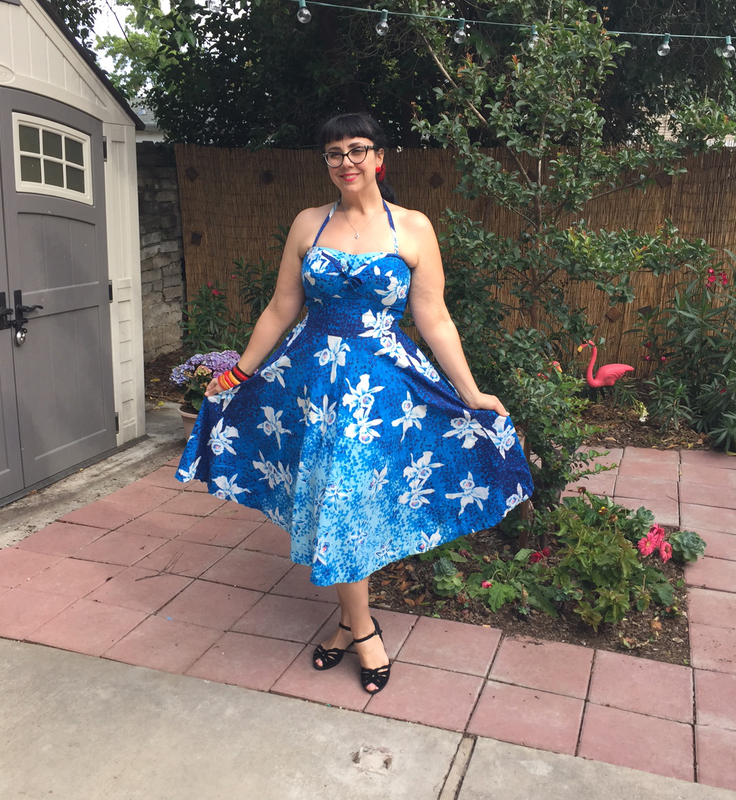 Shark Week: Hawaiian sundress by Hearts & Found! Sponsored Link: Pure Costumes is ready for Halloween! 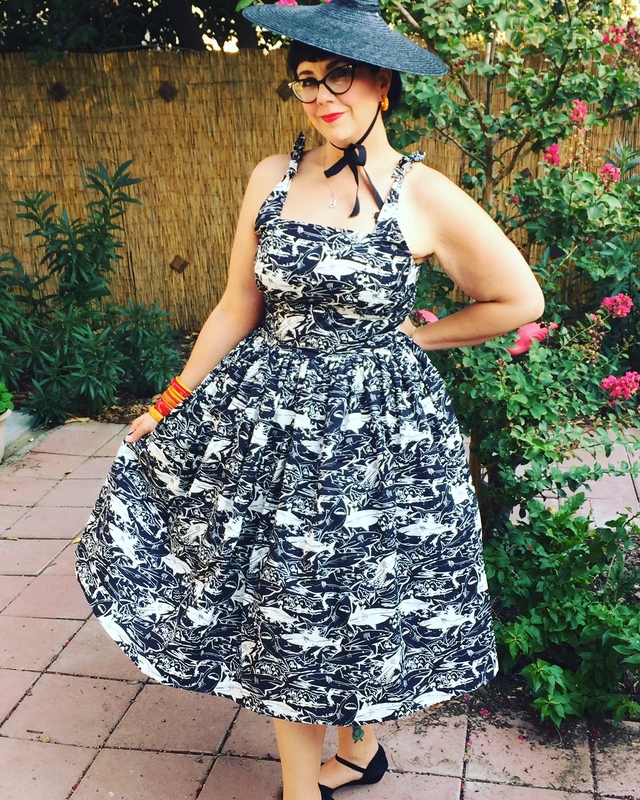 Not too long ago, my friend Jessica recommended the retro designs of Hearts & Found, an Etsy company offering a vast array of pretty vintage styles in pretty prints. While perusing the shop, I found a lovely Hawaiian sundress (similar to a Shaheen design) with shoulder ties and a full skirt. Even better, it was pictured in a soft black-and-white cotton fabric featuring great white sharks! While not exactly a shark fan, I found the art charming and the color scheme bold and attractive – perfect to combine with colorful cropped cardigans and bakelite jewelry! Hawaiian vintage dress for Spring! I recently received this beautiful vintage Hawaiian dress by Kamehameha, worthy of an immediate walk around the block. Literally, as I wore it to see President Bill Clinton speak at a Hillary Clinton organizing event down the street from my house. I figured the blue and white cattleya orchid print offered the correct partisan colors. To finish the patriot look, I added bakelite in red, black, and yellow plus a red MAK cardigan to match the small red accents in the print. This specific style and print have been favorites of mine for awhile now. Special thanks to Erika of Frosted Kookie Vintage for letting me take it off her hands! I don’t consider myself much of a “Disney bounder,” but I do love me some Disney theme park and I especially love 1. the Haunted Mansion attraction at both American Disney resorts and 2. Mickey’s Not-So-Scary Halloween Party at Walt Disney World’s Magic Kingdom. 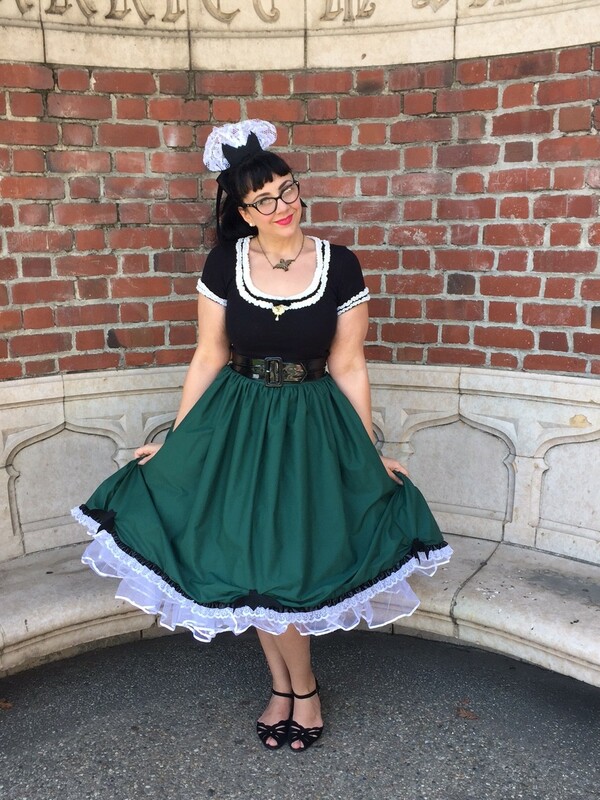 I plan to attend my second “MNSSHP” this coming September, and will be wearing NerdBound’s Haunted Mansion Ghost-ess skirt when I go! 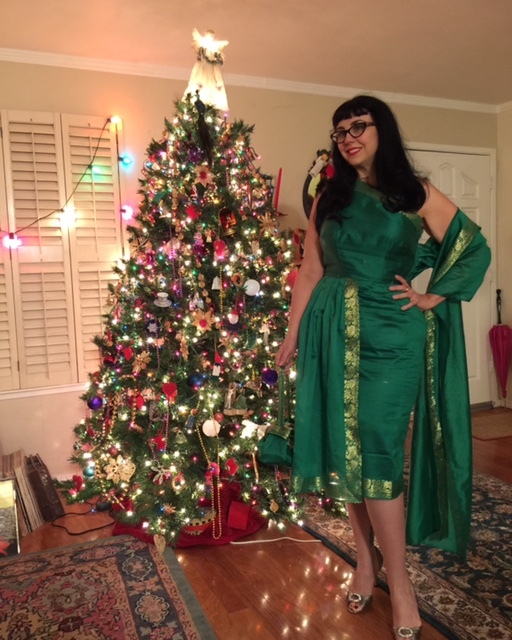 A new mid century-style sari dress for the new year! Happy new year! I’ve resolved to spend more time blogging this year, so I’m starting with my New Year’s Eve outfit. 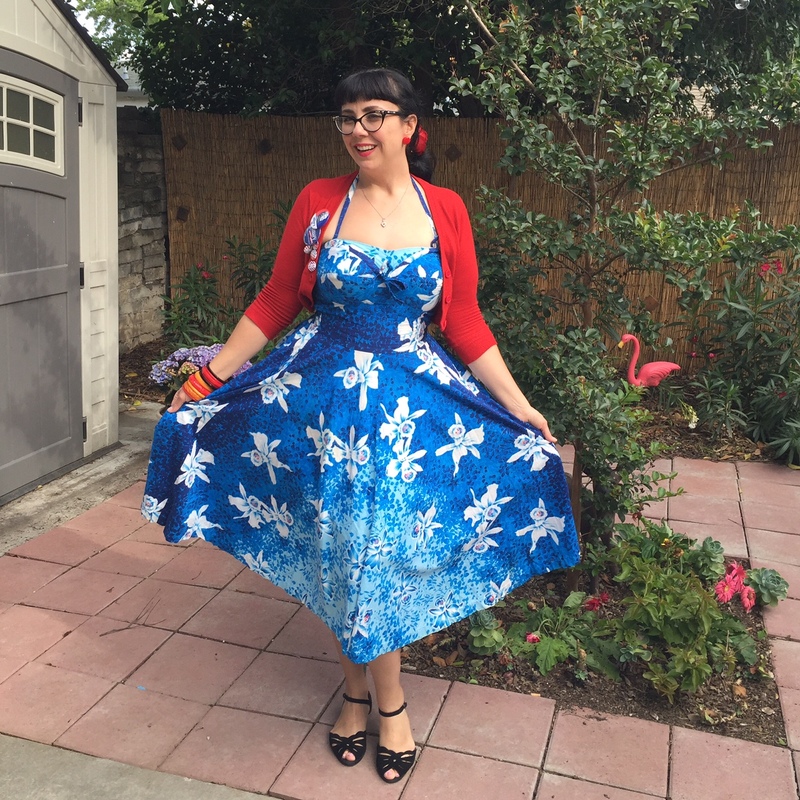 After seeing a beautiful mid century-style sari dress by Jeannette Redhead of Redhead’s Vintage on the Ooh La La! Vintage Facebook group, I promptly ordered one. Old Hollywood glamor pinup for the holidays! 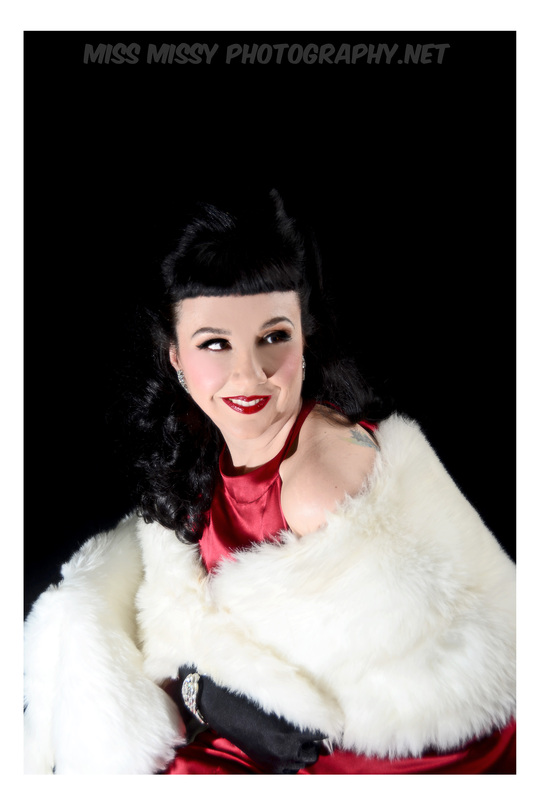 Last year, Missy of Miss Missy Photography and I put together some beautiful old Hollywood-inspired images. I’ve posted at least one already, but there are more that I’ve saved for a special occasion like this one. As the Christmas season is rapidly approaching, I thought I’d share these festive images. 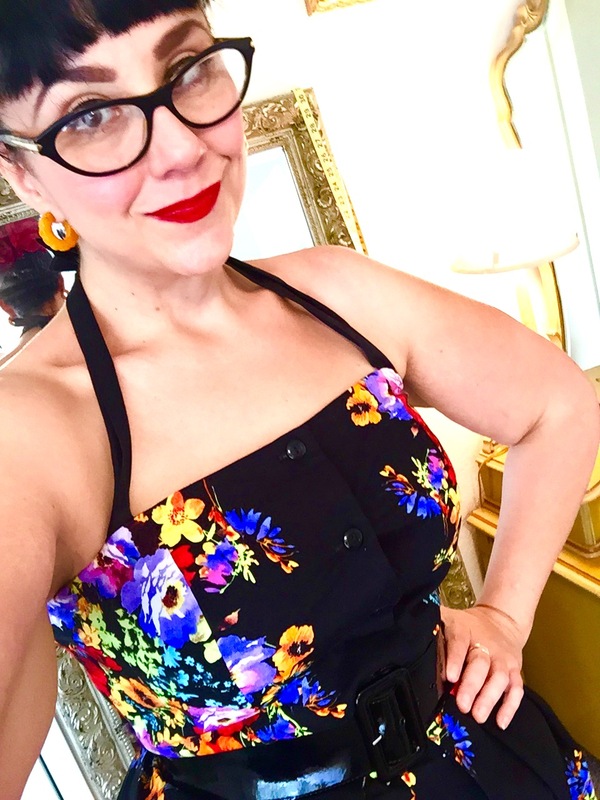 Heart of Haute Eden Floral Erika set – Perfect for summer! Summer school is over and I finally have some time to blog pose for oversaturated selfies! Because hot summer weather lasts forever until November here in my part of NorCal, I figured it was time to bust out some of my recent purchases.